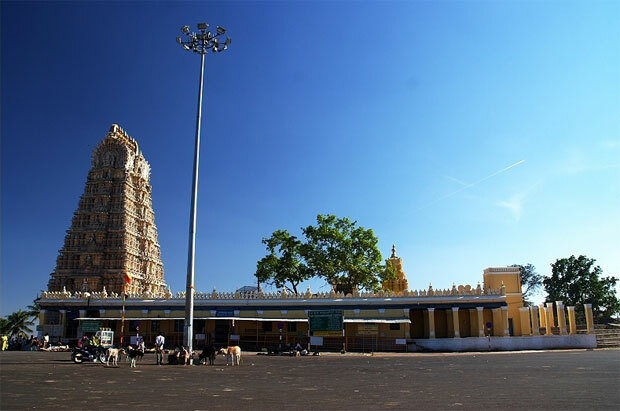 Nearer to Mysore city this hill houses the famous goddess Chamundeshwari and the temple is located at the top of the hill. On the way to temple from the hill you can get a breath taking view of Mysore city and in the evening time you can see the illuminations of the Mysore Palace(during Sundays evening 7 to 8pm and during festivals) . 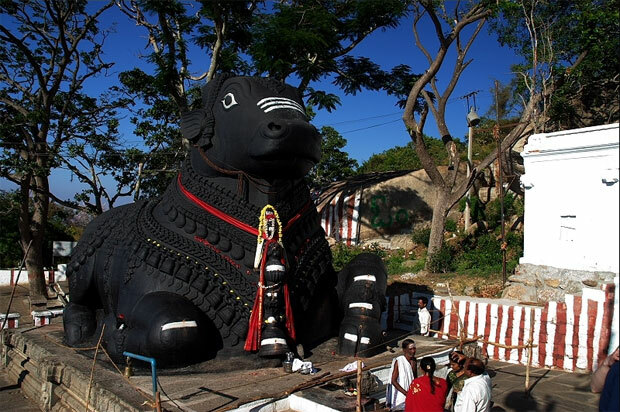 On the way from temple to Mysore while getting down, you can see the monolithic carving of Nandi, Lord Shiva�s bull. The bull is nearly 5mts height. Chammundi Hill is located just outside the city of Mysore within a distance of 12 KM. You can travel by any vehicle, or you can climb the 1000 steps laid by the Mysore Maharaja in 17th century to reach the top of the hill. Inside the temple Photography is not allowed but in other places around the hill there is no restriction. There is no place to deposit your camera so you can carry inside. The statue of the demon Mahishasura is located nearer to the temple. 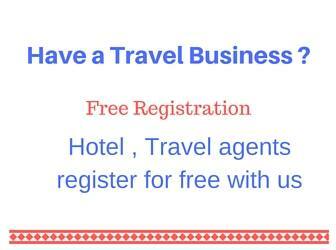 There are variety of places for food and refreshments. Visitors can visit Lalith Mahal Palace while returning from Chamundi Hill. Lalitha mahal palace is located at the foot hill of chamundi hill. Visit the Picture gallery to view the images of Chamundi hill and Mysore city from top of the hill. Visit the Mysore home page to get the details of other visiting places and distances in Mysore district of Karnataka state.